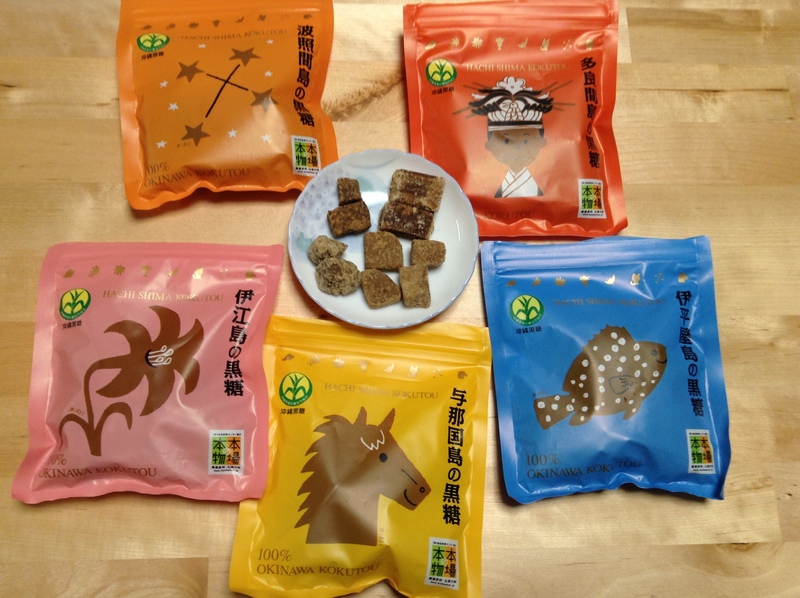 Do you know about kokutō? Black sugar that is harvested on the islands south of Kagoshima in Okinawa. It is a dark sugar that is rich in minerals and is 100% natural sugar cane. We often keep a jar of kokutō on the counter. It makes a nice little snack. Kokutō can be cooked with water to make a syrup for desserts. This with some kinako, roasted soybean powder, over vanilla ice cream, is a combination of flavors that most people love. A friend of ours is an editor of a famous food magazine in Tokyo. He is a fountain of information and I never share a meal with him without my notebook and pen. 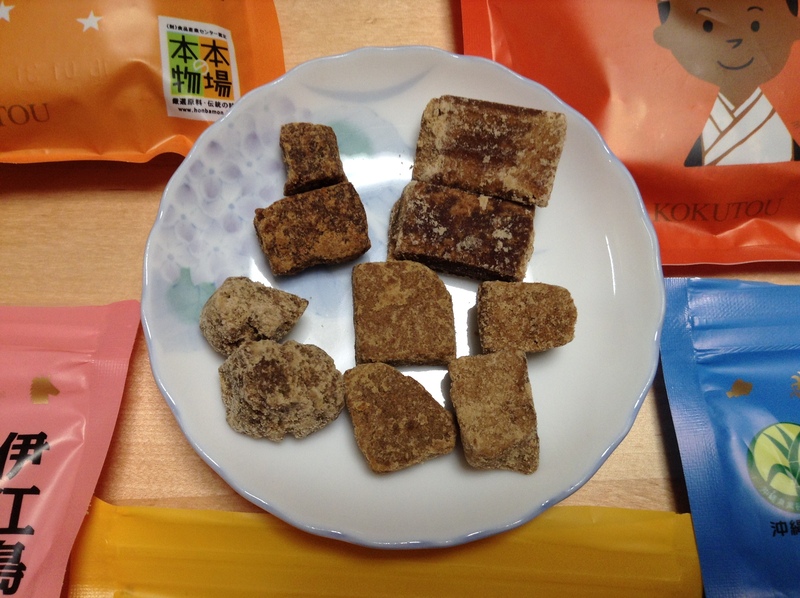 At a recent dinner party we were talking about kokutō and he said that each island produces a different flavor of black sugar. Of course, that totally makes sense, but how different could the flavors be? Shinji picked up five different kokutō at the Washita Okinawa antenna shop in Ginza. Each from a different island. First of all, they all look very different from each other. Who knew? And, drumroll…….they do all taste very different from each other. Ie-shima 伊江島 (pink) *** Our favorite. Light in color, not too sweet and surprisingly salty. Rich in flavor and very natural. Will go back for this. Yonaguni-jima 与那国島 (yellow) ** Medium in color. Light in flavor, not as rich as Ieshima. A hint of saltiness. Hard texture and cut into squares. Iheya-jima 伊平屋島 (blue) * Light in color. For both of us it was too sweet, much like sugar. Tarama-jima 多良間島 (dark orange) * Dark color and very hard texture. Sweet and rich flavor. Hateruma-jima 波照間島 (light orange) ** Very dark in color. Blocks are very chewy. Rich mineral flavor. Overall the Ie-shima was our favorite. We loved that it wasn’t too sweet and the saltiness was a surprise at first, but we came to love it. Most people love kokutō when they try it. Note on the names. Shima means island in Japanese. Sometimes the pronunciation of shima can change to jima depending on what name comes before it. Thank you once again for clearing the fog in the myriad of foods to be found in Tokyo! Look forward to a trip to Washita to pick up your recommendations! Did you like the steamed cakes? I am not a big fan of mushipan (steamed breads), but I do love anything made with kokutō. The Washita shop is lovely. Also pick up some umi budō (sea grapes), mozuku (another sea vegetable), and a bottle of awamori. The basement is also nice and has some lovely tableware. I had no idea either. I have tried a few of the different ones, but never at the same time. I guess it’s like when you first get into wine.